A rock; dense cryptocristalline mixture of serpentine group minerals, mainly antigorite. 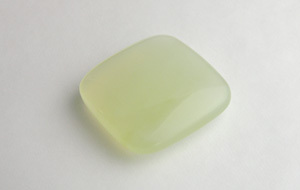 Also known as Xinshan jade. 2 specimens: 0615 — 30.00 ct, China, Liaoning; 0614 — 39.79 ct, China, Liaoning.